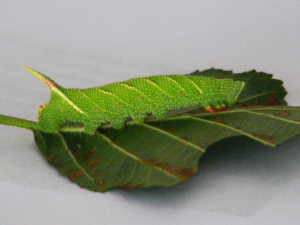 Observation - Lime Hawk Moth caterpillar - UK and Ireland. Description: Seen last year in my garden. Unfortunately we had to remove the Lime trees at the end of the year so probably won't see them again. Seen last year in my garden. Unfortunately we had to remove the Lime trees at the end of the year so probably won't see them again.